Whenever you define a new class, you also create a new type with the same name. So way back in Section 1.4, when we defined the class Hello, we created a type named Hello. We didn’t declare any variables with type Hello, and we didn’t use new to create a Hello object. It wouldn’t have done much if we had – but we could have! Defining a class creates a new object type with the same name. Every object belongs to some object type; that is, it is an instance of some class. A class definition is like a template for objects: it specifies what attributes the objects have and what methods can operate on them. The new operator instantiates objects, that is, it creates new instances of a class. Think of a class like a blueprint for a house: you can use the same blueprint to build any number of houses. The methods that operate on an object type are defined in the class for that object. One common reason to define a new class is to encapsulate related data in an object that can be treated as a single unit. That way, we can use objects as parameters and return values, rather than passing and returning multiple values. This design principle is called data encapsulation. We have already seen two types that encapsulate data in this way: Point and Rectangle. Another example, which we will implement ourselves, is Time, which represents a time of day. The data encapsulated in a Time object are an hour, a minute, and a number of seconds. Because every Time object contains these data, we define attributes to hold them. Attributes are also called instance variables, because each instance has its own variables (as opposed to class variables, coming up in Section 12.3). The first step is to decide what type each variable should be. It seems clear that hour and minute should be integers. Just to keep things interesting, let’s make second a double. The Time class is public, which means that it can be used in other classes. But the instance variables are private, which means they can only be accessed from inside the Time class. If you try to read or write them from another class, you will get a compiler error. Private instance variables help keep classes isolated from each other so that changes in one class won’t require changes in other classes. It also simplifies what other programmers need to understand in order to use your classes. This kind of isolation is called information hiding. The name of the constructor is the same as the name of the class. Constructors have no return type (and no return value). The keyword static is omitted. This constructor does not take any arguments. Each line initializes an instance variable to zero (which in this example means midnight). The name this is a keyword that refers to the object we are creating. You can use this the same way you use the name of any other object. For example, you can read and write the instance variables of this, and you can pass this as an argument to other methods. But you do not declare this, and you can’t make an assignment to it. A common error when writing constructors is to put a return statement at the end. Like void methods, constructors do not return values. When you invoke new, Java creates the object and calls your constructor to initialize the instance variables. When the constructor is done, new returns a reference to the new object. In this example, the reference gets assigned to the variable time, which has type Time. Figure 11.1 shows the result. Figure 11.1: State diagram of a Time object. Like other methods, constructors can be overloaded, which means you can provide multiple constructors with different parameters. Java knows which constructor to invoke by matching the arguments you provide with the parameters of the constructors. All this constructor does is copy values from the parameters to the instance variables. In this example, the names and types of the parameters are the same as the instance variables. As a result, the parameters shadow (or hide) the instance variables, so the keyword this is necessary to tell them apart. Parameters don’t have to use the same names, but that’s a common style. Overloading constructors provides the flexibility to create an object first and then fill in the attributes, or collect all the information before creating the object itself. Once you get the hang of it, writing constructors gets boring. You can write them quickly just by looking at the list of instance variables. In fact, some IDEs can generate them for you. Recall that the instance variables of Time are private. We can access them from within the Time class, but if we try to access them from another class, the compiler generates an error. We could make the instance variables public. We could provide methods to access the instance variables. We could decide that it’s not a problem, and refuse to let other classes access the instance variables. The first choice is appealing because it’s simple. But the problem is that when Class A accesses the instance variables of Class B directly, A becomes “dependent” on B. If anything in B changes later, it is likely that A will have to change, too. But if A only uses methods to interact with B, A and B are “independent”, which means that we can make changes in B without affecting A (as long as we don’t change the method signatures). Methods like these are formally called “accessors”, but more commonly referred to as getters. By convention, the method that gets a variable named something is called getSomething. These methods are formally called “mutators”, but more commonly known as setters. The naming convention is similar; the method that sets something is usually called setSomething. Writing getters and setters can get boring, but many IDEs can generate them for you based on the instance variables. When Java displays the value of an object type, it displays the name of the type and the address of the object (in hexadecimal). This address can be useful for debugging, if you want to keep track of individual objects. As a reminder, you need to use \%d with integers and \%f with floating-point numbers. The 02 option means “total width 2, with leading zeros if necessary”, and the 04.1 option means “total width 4, one digit after the decimal point, leading zeros if necessary”. Every object type has a method called toString that returns a string representation of the object. When you display an object using print or println, Java invokes the object’s toString method. The definition does not have the keyword static, because it is not a static method. It is an instance method, so called because when you invoke it, you invoke it on an instance of the class (Time in this case). Instance methods are sometimes called “non-static”; you might see this term in an error message. Inside the method, we use this to refer to the current instance; that is, the object the method is invoked on. Instead of printf, it uses String.format, which returns a formatted String rather than displaying it. In this example, this in toString refers to the same object as time. The output is 11:59:59.9. We have seen two ways to check whether values are equal: the == operator and the equals method. With objects you can use either one, but they are not the same. The == operator checks whether objects are identical; that is, whether they are the same object. The equals method checks whether they are equivalent; that is, whether they have the same value. The definition of identity is always the same, so the == operator always does the same thing. But the definition of equivalence is different for different objects, so objects can define their own equals methods. Figure 11.2 is a state diagram that shows these variables and their values. Figure 11.2: State diagram of three Time variables. The assignment operator copies references, so time1 and time2 refer to the same object. Because they are identical, time1 == time2 is true. But time1 and time3 refer to different objects. Because they are not identical, time1 == time3 is false. By default, the equals method does the same thing as ==. For Time objects, that’s probably not what we want. For example, time1 and time3 represent the same time of day, so we should consider them equivalent. Inside the equals method, this refers to the same object as time1, and that refers to the same object as time3. Since their instance variables are equal, the result is true. Many objects use a similar notion of equivalence; that is, two objects are equivalent if their instance variables are equal. But other definitions are possible. Suppose you are going to a movie that starts at 18:50 (or 6:50 PM), and the running time is 2 hours 16 minutes. What time does the movie end? We could write a static method that takes the two Time objects as parameters. We could write an instance method that gets invoked on one object and takes the other as a parameter. We removed the keyword static. We removed the first parameter. We replaced t1 with this. Optionally, you could replace t2 with that. Unlike this, that is not a keyword; it’s just a slightly clever variable name. That’s all there is to it. Static methods and instance methods do the same thing, and you can convert from one to the other with just a few changes. There’s only one problem: the addition code itself is not correct. For this example, it returns 20:66, which is not a valid time. If second exceeds 59, we have to “carry” into the minutes column, and if minute exceeds 59, we have to carry into hour. It’s still possible that hour may exceed 23, but there’s no days attribute to carry into. In that case, sum.hour -= 24 would yield the correct result. 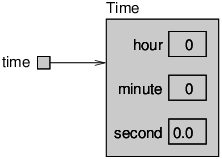 The increment method modifies an existing Time object. It doesn’t create a new one, and it doesn’t return anything. They don’t modify the parameters. They don’t have any other “side effects”, like printing. The return value only depends on the parameters, not on any other state. Methods like increment, which breaks the first rule, are sometimes called modifiers. They are usually void methods, but sometimes they return a reference to the object they modify. Modifiers can be more efficient because they don’t create new objects. But they can also be error-prone. When objects are aliased, the effects of modifiers can be confusing. To make a class immutable, like String, you can provide getters but no setters and pure methods but no modifiers. Immutable objects can be more difficult to work with, at first, but they can save you from long hours of debugging. Previously, we defined a class as a collection of related methods. Now you know that a class is also a template for a new type of object. A member of a class. Every object is an instance of some class. Create a new instance of a class in the computer’s memory. A technique for bundling multiple named variables into a single object. An attribute of an object; a non-static variable defined at the class level. The practice of making instance variables private to limit dependencies between classes. A special method that initializes the instance variables of a newly-constructed object. Defining a local variable or parameter with the same name and type as an instance variable. A class that uses objects defined in another class. A method that returns the value of an instance variable. A method that assigns a value to an instance variable. Replacing a default implementation of a method, such as toString. A non-static method that has access to this and the instance variables. Two values that are the same; in the case of objects, two variables that refer to the same object. Two objects that are “equal” but not necessarily identical, as defined by the equals method. A static method that depends only on its parameters and no other data. A method that changes the state (instance variables) of an object. The code for this chapter is in the ch11 directory of ThinkJavaCode. See page ?? for instructions on how to download the repository. Before you start the exercises, we recommend that you compile and run the examples. At this point you know enough to read Appendix B, which is about simple 2D graphics and animations. During the next few chapters, you should take a detour to read this appendix and work through the exercises. Review the documentation of java.awt.Rectangle. Which methods are pure? Which are modifiers? If you review the documentation of java.lang.String, you should see that there are no modifiers, because strings are immutable. The implementation of increment in this chapter is not very efficient. Can you rewrite it so it doesn’t use any loops? Hint: Remember the modulus operator. In the board game Scrabble, each tile contains a letter, which is used to spell words in rows and columns, and a score, which is used to determine the value of words. Write a definition for a class named Tile that represents Scrabble tiles. The instance variables should include a character named letter and an integer named value. Write a constructor that takes parameters named letter and value and initializes the instance variables. Write a method named printTile that takes a Tile object as a parameter and displays the instance variables in a reader-friendly format. Write a method named testTile that creates a Tile object with the letter Z and the value 10, and then uses printTile to display the state of the object. Implement the toString and equals methods for a Tile. Create getters and setters for each of the attributes. The point of this exercise is to practice the mechanical part of creating a new class definition and code that tests it. Exercise 4 Write a class definition for Date, an object type that contains three integers: year, month, and day. This class should provide two constructors. The first should take no parameters and initialize a default date. The second should take parameters named year, month and day, and use them to initialize the instance variables. Write a main method that creates a new Date object named birthday. The new object should contain your birth date. You can use either constructor. A rational number is a number that can be represented as the ratio of two integers. For example, 2/3 is a rational number, and you can think of 7 as a rational number with an implicit 1 in the denominator. Define a class called Rational. A Rational object should have two integer instance variables that store the numerator and denominator. Write a constructor that takes no arguments and that sets the numerator to 0 and denominator to 1. Write an instance method called printRational that displays a Rational in some reasonable format. Write a main method that creates a new object with type Rational, sets its instance variables to some values, and displays the object. At this stage, you have a minimal testable program. Test it and, if necessary, debug it. Write a toString method for Rational and test it using println. Write a second constructor that takes two arguments and uses them to initialize the instance variables. Write an instance method called negate that reverses the sign of a rational number. This method should be a modifier, so it should be void. Add lines to main to test the new method. Write an instance method called invert that inverts the number by swapping the numerator and denominator. It should be a modifier. Add lines to main to test the new method. Write an instance method called toDouble that converts the rational number to a double (floating-point number) and returns the result. This method is a pure method; it does not modify the object. As always, test the new method. Write an instance method named reduce that reduces a rational number to its lowest terms by finding the greatest common divisor (GCD) of the numerator and denominator and dividing through. This method should be a pure method; it should not modify the instance variables of the object on which it is invoked. Hint: Finding the GCD only takes a few lines of code. Search the web for “Euclidean algorithm”. Write an instance method called add that takes a Rational number as an argument, adds it to this, and returns a new Rational object. There are several ways to add fractions. You can use any one you want, but you should make sure that the result of the operation is reduced so that the numerator and denominator have no common divisor (other than 1). The purpose of this exercise is to write a class definition that includes a variety of methods, including constructors, static methods, instance methods, modifiers, and pure methods.